This beer-braised corned beef is slow cooking at its best. Everything – main dish and sides – cook together for a meal you’ll anticipate all day. The ultimate one pot meal, it is a St. Patrick’s Day classic I’m happy to eat any time of year! 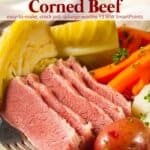 I’m definitely a fan of corned beef, even though it’s a WW splurge. 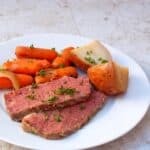 But since I’m always looking for ways to make things quicker, easier and simpler, for the past few years I’ve been experimenting with different slow cooker corned beef and cabbage recipes instead. I’m so glad I did. 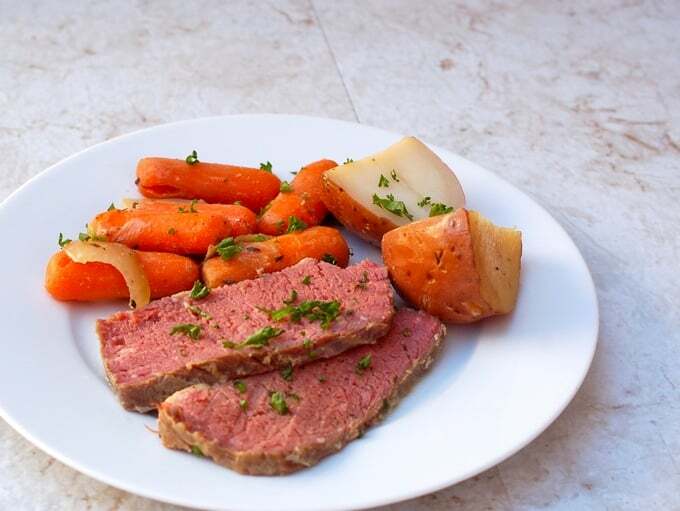 If you’ve made this Beer-Braised Corned Beef Dinner, please give the recipe a star rating below and leave a comment letting me know how you liked it. And stay in touch on Pinterest, Facebook, Instagram and Twitter for the latest updates. This is slow cooking at its best. Everything - main dish and sides - cook together for a meal you'll anticipate all day. Ideal Slow Cooker Size: 6 to 7-Quart oval. Place the potatoes, carrots, onions in the slow cooker. Sprinkle with the thyme and add the bay leaf. Trim any excess fat from the meat. Place the meat on top of the vegetables. Pour reserved juices and spices from the brisket and the beer over the mixture. Lay the cabbage wedges around and on top of the meat. Cover and cook on LOW for 8 to 10 hours or until the meat and vegetables are tender. Remove the bay leaf and discard. Transfer meat to a serving platter and thinly slice across the grain. Using a slotted spoon transfer the vegetables to a serving bowl. Serve the meat and vegetables with reserved cooking liquid if desired. First time I made it my family loved it and this is the only way I will cook corned beef and cabbage again. Thanks for sharing this recipe.